Robotics team Xenith was very close to disassembling its robot for the season. 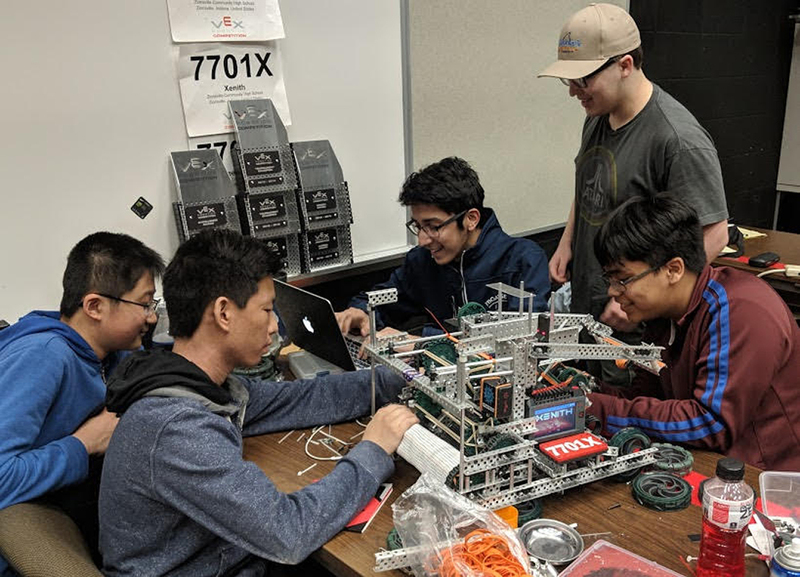 Team members then learned they’d received a slot – randomly selected from a waitlist – to the April 24-27 VEX Robotics World Championship in Louisville. As the Zionsville Community High School team prepares for the world championship, its goal is to refine skills and get its robot in the best possible shape. Team members hope they’ll be paired against easier competition than they faced at the state level, where the luck of the draw pitted them against tough teams. “We could have done better,” team member Joey Shao said. The team also was plagued by unexpected static electricity at Lucas Oil Stadium during the state competition. The team members agrees that Indiana provides some of the toughest competition in the world. “The average is so much higher than so many other places,” Carlos Morales said. Xenith will compete against another ZCHS team, Tesseract, which qualified by placing 10th at the state championship in March, and a team from Park Tudor led by Zionsville resident Zach Phelps. The third time may be a charm for Phelps. The Park Tudor freshman has been to the VEX Robotics World Championships twice without a successful finish. This time his team, Pigpen, is in a prime position, having won the national tournament and the excellence award in Iowa in early April. The three teams aren’t strangers to each other in competition. “Being top-tier teams, we have scrimmaged together a lot,” Phelps said. Last year, 1,600 teams from 30 nations competed at the VEX Robotics World Championship.